Never Let Me Go [Book Review] – my books. my life. Kathy, a successful carer, is nearing the end of her career. As her present life moves forward, the story shifts to her upbringing at the Hailsham boarding school. There she befriends Tommy and Ruth. The book follows them through their time at Hailsham, their time as young adults in the Cottages, and then on to their present lives. It sounds quiet, but there is much more going on beneath the surface that I’ll leave you to discover on your own. 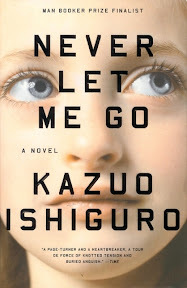 Never Let Me Go is one of those books that I should have read a long time ago, kept meaning to read, and then finally picked up after being badgered my my husband for years. So I expected it to be amazing. What I found was something that was very good but didn’t quite live up to that expectation of amazing. I can’t really put my finger on what was missing for me. It might be that I figured out what was going on pretty early in the novel (was it supposed to be a secret all the way until the end or were we supposed to know the whole time?). It might simply be a case of setting my hopes to high. Either way, something about the novel just wasn’t quite there for me. That said, the novel is beautifully written and absolutely intriguing, as well as a perfect amount of creepy. It raises interesting questions about what it is to be human and how far technology should go. Despite that missing Something, I would highly recommend it to fellow dystopian fans and anyone interested in a thoughtful, well-written novel. I am anxious to read more of Kazuo Ishiguro in the future. I was going to share some passages to prove to you that it is, in fact, beautiful, but Ben thought it was a good idea to loan out our copy before I finished writing this review. I felt the same way! It was perfectly enjoyable, but it didn’t blow me away. I just got a copy of this book and plan to read it in the near future. I’m very intrigued and think I’ll enjoy it, even if I don’t love it. Or, at the very least, I’ll stop feeling left out because I’ve not read it! I felt exactly the same way! I didn’t figure it out early, or ever really, partly because I kept expecting for there to be more to the story. I thought the writing was beautiful, too, but I didn’t feel sad I hadn’t read it until years after I planned. I did love The Remains of the Day by Ishiguro, but I’m not sure if it’s a book for everyone. Heard of this title but never knew what it was about. Thanks for the lovely review and recommendation. This is right up my alley.